A key panel in the Argentine Senate on Tuesday advised senators to reject a gay marriage bill, Parlamentario.com reported. Eight members of the Senate General Law Committee joined its chairwoman, Senator Liliana Negre de Alonso, in recommending that a gay marriage bill approved in May by Argentina's lower house, the Chamber of Deputies (la Camara de Diputados), be rejected in the Senate. Six committee members voted to recommend the bill's approval. Another five members advised senators to reconsider a bill rejected in May by the lower house that would recognize gay and lesbian couples with civil unions. That legislation, however, bans gay couples from adopting. The vote comes after the committee aired out the issue during a series of debates in the country's capital of Buenos Aires and in four provincial capital cities. The full Senate is scheduled to take up the bill on July 14, next Wednesday. While senators are free to vote their conscience, the panel's recommendation is likely to weigh heavily in the divided chamber. Also on Tuesday, the head of the political block Frente para la Victoria (Front for Victory), Senator Miguel Angel Pichetto Michelangelo, expressed confidence that senators would approve the measure next week. Only in Mexico City can gay and lesbian couples legally marry in Latin America. 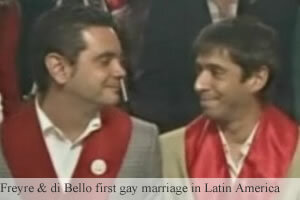 However, eight gay couples have married in Argentina since December after various judges – mostly in liberal Buenos Aires – OK'd their applications.